The NES has a vast library but you’re probably not familiar with everything the system has to offer. We’re all familiar with the Mario titles and the games from Nintendo, but there are some more obscure titles out there lurking under the radar that are just as good and just as deserving of the public’s love and attention. Coming to the video game industry during a time of immense change, the NES was the first system since the Atari 2600 to become a bona fide commercial hit – and it couldn’t have come any sooner. The crash of the video game industry in 1983 nearly doomed the whole segment to the dustbin of history. If not for Nintendo’s attention to quality and consistent ability to produce triple-A titles even then it is hard to imagine where the industry would be now. One of the biggest reasons that the industry declined and collapsed is because the software released for gaming consoles were a step above shovelware. The gold rush to make money off of the new video games’ industry led to the production of a lot of unfortunate software but those games aren’t on this list. Instead we’ve gathered ten games here that you may or may not have heard of before but which represents the best underrated games on the NES. From SNK, the makers of the Neo Geo, Crystalis is an action role playing game that takes a little bit of inspiration from Square’s Final Fantasy and Nintendo’s own The Legend of Zelda. Sporting bright, colorful graphics and a fully-realized score, Crystalis also has a great story and engaging gameplay that makes it unique and charming while also remaining challenging and fun. Released in 1990 towards the end of the NES’ life, Crystalis truly pushes the hardware to the limits and looks good even today. While the game keeps the NES’ trademark vagaries to a minimum, Crystalis nonetheless suffers from the same syndrome that many early 8-bit titles do and that is being obscure and hard because it is obscure. Thankfully we have the Internet now but people weren’t so lucky back in the early 1990s, making Crystalis one of those games you had to figure out among friends. 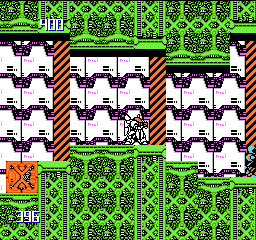 This game is quite strange but also, like Crystalis, visually impressive for what it does on the NES. Released towards the ends of the 1980s, Godzilla for the NES has gigantic sprites and features much of the pantheon of the Godzilla canon, pitting Godzilla or Mothra against everyone from Mecha Godzilla to King Ghidorah, all of which are lovingly realized in huge, detailed pixel sprites. That is probably the most striking feature of Monster of Monsters and that is the size of the monsters relative to their human opponents. For the NES, these sprites are huge and well animated. Though challenging in the end, Godzilla is a must-play for fans of the Toho kaiju universe. No one is left out and every trope is here including electric fire and impotent human military forces. Coming from Rare for the NES, Wizards and Warriors debuted in 1987 and featured an adventure role-playing game setup that was unique for the NES at the time. Though challenging, the game did feature unlimited continues which helped many gamers complete its otherwise obscure tasks. Spawning a series of games in its wake, Wizards and Warriors was a bit of a surprise success for the 8-bit Nintendo system and helped establish Rare as a developer with which to be reckoned. Atari’s outfit Tengen used to release games for the NES on those huge, ugly black cartridges that just screamed “unauthorized.” And they were – among them RBI Baseball, one of the best sports games released on the NES. Developed by Atari and brought to their rival’s system by the company created just for that purpose. RBI Baseball was the first baseball title to feature the official Major League Baseball Association label and had rosters and teams from the actual sport as well. Player abilities vary – from hitting the ball to speed – introducing a concept concerning player stats that is a cornerstone of baseball games now. Pioneers are often punished for their daring, but not RBI Baseball. Establishing many of the mechanics we take for granted today, RBI Baseball is Atari at their best. This side-scrolling shooter from Konami is, like many of the games on this list, a visually impressive game that came out later in the NES life and suffered because of it. Tied in with a whole universe that, while quite established, was quite new to most people in the mainstream public, Bucky O’Hare hoped to ride the Teenage Mutant Ninja Turtles wave to success and the game released with an animated show, toy line, and revamped comic series to boot. Heck, Konami even gave Bucky O’Hare the full arcade game treatment in one of their more obscure arcade titles. If you’re hankering for more Teenage Mutant Ninja Turtles: Turtles in Time action or are a huge fan of The Simpsons arcade game, the Bucky O’Hare NES title or arcade game might help you scratch that itch. If there is one thing you can usually take to the bank in the world of video games it is that movie adaptations, by and large, stink. Developed by Atlus and published by the infamous LJN, The Karate Kid is based on the film of the same name and follows the story of Daniel and his sensei Mr. Miyagi through four levels facing off against opponents in scenarios that vaguely mirror what was depicted in the film. Ostensibly a fighting game in the vein of Karate Champ, The Karate Kid is a tough game but, for fans of the film, it is worth it. 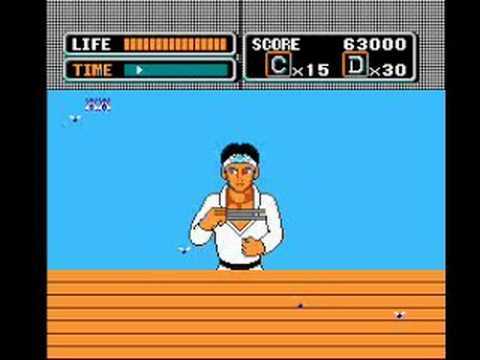 We wouldn’t normally recommend an LJN title, but The Karate Kid is definitely among the more underappreciated titles on the NES. Another game developed by Atlus but published by Hudson Soft, Xexyz combines a side-scrolling action platformer with a side-scrolling shooter in an amalgamation that is both unique and a lot of fun. Odd-numbered stages are the platforming segments while even-numbered stages comprise the shooting segments so it’s easy to predict what you’ll be doing but it’s not exactly on-the-fly like going between gameplay modes is today. Of course like other games in both genres there are power ups and various upgrades that players can obtain to make their way a little easier but the action is quite tight and can be intense in that old 8-bit spirit. Taito’s Little Samson came out in 1992 and was swept away by the coming tide of 16-bit systems like the SNES. The best way to describe Little Samson is as a fantasy-themed Mega Man type game. 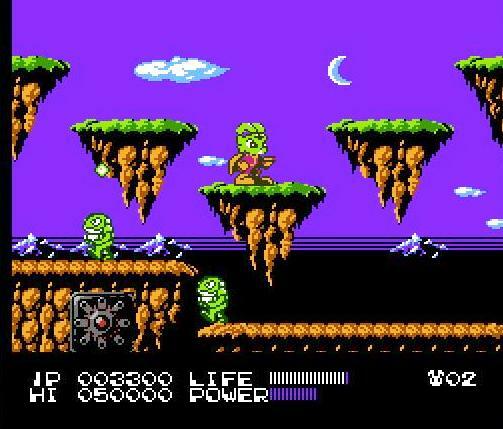 Like other triple-A titles in the end of the NES’ life, Little Samson pushes the game machine and shows off what it can do in the process. Everything comes together in this game from music to graphics to sound. It really is a shame that Little Samson was ignored when it was released but it is not shocking given the tendency of the industry to swing for what’s new. Like other games on this list, Adventure Island was merely overshadowed by stronger competitors. But don’t be fooled, this title from Hudson Soft is an excellent game and shows why Hudson Soft and Nintendo work so closely together. 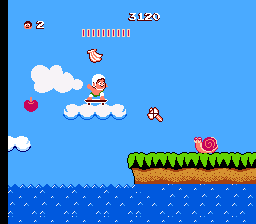 Featuring levels of quality that one would expect in a Nintendo title, Adventure Island is tough as nails – the player’s first warning that not all is as it seems. Though it would later be resurrected on SNES as Super Adventure Island, the original game still holds a place in most gamers’ hearts. Tamtex’s action-platformer Metal Storm came out at the end of the NES’ life like other games on this list. And, like the others, fell victim to the release of the SNES. Taking full advantage of the NES’ hardware, Metal Storm is a case study in how to make a pixel game. In fact, modern gamers will be struck by how intense an experience Metal Storm is as the animation, sound, and gameplay is spot on and rivals the best of the arcades at the time. 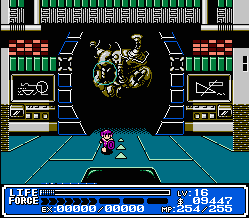 Though sci-fi themed, Irem’s Metal Storm also holds on to the late 1980’s action sci-fi film aesthetic and is very much a product of its time. Pushed hard by Nintendo when it came out, Metal Storm exists today as one of the best of the last of the NES games.